Select the biggest pot as possible for your container tomatoes. The more space your tomato has to grow in, the healthier it will be. The best types of tomatoes to grow in containers are bush varieties, dwarf varieties, short-season varieties, and determinate varieties – for obvious reasons: they don’t get as big as other types of tomatoes, they mature faster, and they finish growing at a certain point in the season. Buy tomato seedlings rather than starting your plants from seed to give your container tomatoes a strong start. Extra tip: plant one plant per container so it doesn’t compete with other tomato plants or companion plants for space, water, and nutrients. Tomatoes grown in containers need a loose, well-drained soil with lots of organic matter. Successful gardeners recommend using a good potting mix rather than potting soil or garden soil. Potting soil can be too heavy for containers. Soil harvested straight from the garden is most likely infested with fungi, weed seeds, and pests. Learn what to look for in a good potting mix and how to save money by making your own. Extra tip: moisten your potting mix slightly before planting. Tomatoes need at least 6-8 hours of full sun a day. Before planting tomatoes in pots, choose a spot for your containers – one where they get enough light. Monitor the spot at regular intervals during the day to track exposure. 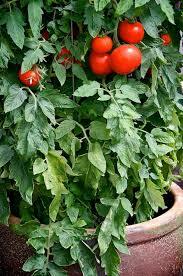 One of the biggest dangers to container tomatoes is that the soil dries out. During a heat wave you may need to water them daily. Whether you set your tomato pots near your garden hose or you have a convenient way to water them with a pitcher or watering can, make sure you have easy access to a water source. You will use it!